The Blue Dot Jawfish, discovered in the Tropical Eastern Atlantic by Allen Roberstson in in 1991. This jawfish has an orange body with bright blue spots. This fish is also known as the Bluespotted Jawfish. An aquarium of 30 gallons or more is non-aggressive fish is ideal. Since the Blue Dot Jawfish likes to burrow, so a sandbed of at least 2.5-3 inches is a must. Only one Blue Dot Jawfish (or a mated pair) should be kept in an aquarium, as it will be aggressive towards it’s own species. 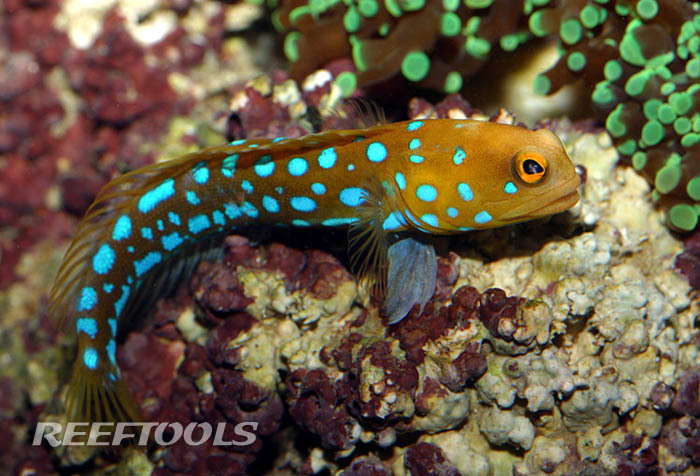 A tight fitting lid or a screen for your tank is highly recommended as the Bluespotted Jawfish is a known jumper. The Blue Dot Jawfish should be offered a diet consisting of mysis shrimp, marine flesh and other meaty foods. This fish should be offered food several times a day. where are my 3-d glasses when I need them? Thats a pretty cool fish. My blue spotted jawfish is the smartest fish in my tank. He will track people walking by, twisting his head and looking like a prarie dog. Within a month, he was tame enough to eat food off my prongs. He’s quite an architect dragging large stones and arranging them in a birm around his main lookout hole! The only downside is that he has buried a few coral frags by spitting coral substrate over them. I moved my scolymia two feet away from his area. Contrary to the description, he is not jumpy at all but I keep a cover over the tank anyhow. These guys really are quite the entertainer. I would encourage anyone to try to breed them as they are in limited supply in the wild and many methods can be learned from Martin Moe’s experience with the Pearly variety!